By Scott Gilfoid: The talented super middleweight contender James DeGale (10-1, 8 KO’s) is a strong possibility for a fight against former WBC/WBO middleweight champion Kelly Pavlik (37-2, 32 KO’s) for a fight in the fall if Pavlik doesn’t wind up facing IBF super middleweight champion Lucian Bute. DeGale’s promoter Frank Warren wants the fight, but it would have to take place in the UK for it to make big money because DeGale is an unknown in the U.S. This would be a great fight! DeGale technically is coming off of a controversial 12 round decision against George Groves last month, but I don’t consider that a loss at all. DeGale looked like the much stronger fighter and had a reluctant spoiler on his hands and had to chase Groves down the last seven rounds. I had DeGale winning by two rounds. I don’t give rounds to runners, especially when they’re getting drilled the way that Groves was. What makes DeGale such a good fight for Pavlik is that DeGale is a southpaw like Bute, and it would be a great fight for Pavlik to try and get ready for Bute. I think Pavlik will lose to DeGale, but it’s still a good fight for Pavlik. 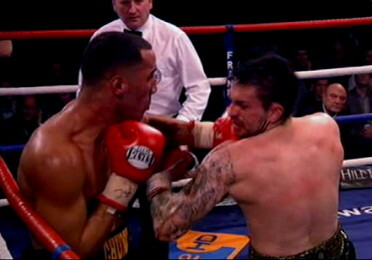 Maybe he’ll learn something from the talented DeGale in losing. This would be a huge fight for DeGale and I can see him becoming a star after this fight. It’s a fight that will easily do huge rating numbers in the UK and I could see this being a pay per view bout.